We have left Osan AB in Korea and are on our way to Kadena AB Okinawa Japan. Lita and I are hoping to catch one of the semi-regular flights from Kadena to the Philippines so we will not have to pay the sky high prices for airline tickets, especially since it would be a last minute thing. Also we want to see what Kadena looks like since we were last there in 1993, especially I want to see. When arriving in Japan you have to go by the Japanese immigration to get stamped into the country, if you are not on military orders. 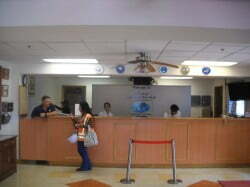 When you arrive the Kadena immigration personnel are suppose to bring you there. When it’s time to leave Japan you have to find your own way there to get your passport stamped out of the country. Well we arrived on Sunday and for some reason there was no one at immigration to take any of us. It still has to be done, so we were lucky because Joe’s son lives and works in Okinawa and he brought us all there to take care of our immigration status. We were told that the taxi ride there cost around $60 round trip, so this free ride was welcomed. 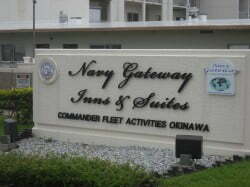 Before we did all that though, we made sure we, just Lita and I, got checked into our billeting at the Navy Gateway Inns and Suites. I made a 2 nights reservation here. Even though we are a day late in arriving, because of the Korea layover, they automatically delayed the reservation when they found out that the flight wasn’t coming in as scheduled. Now that’s what I call good service. That evening, after everything finally settled down, Lita decided she was hungry and wanted to order take out from Manchu Wok. I wanted to order from Popeyes, but there is a $10 minimum for delivery, so I had to order from Manchu Wok also to get a little over the $10 mark. Lita decided to get pepper steak with noodles and I decided on the sweet and sour chicken. From my point of view, neither of them were very good. I would have been much happier with Popeye’s. Shortly after that I took a shower and then got ready for some well needed sleep. In the morning we were thinking about our options for getting back to the Philippines. At this time we are a bit stuck between options because we want to check out the base and outside Gate 2, but we also want to get home. At first we were thinking that unless a big plane comes in soon leaving for the Philippines, then we would probably stay until the beginning of August and next payday. In the end though we decided to just take any flight that will be heading back, whether it be Clark, Manila or anyplace else in the Philippines. Of course if it’s one of the smaller planes, then they only allow a limit of 30 pounds luggage per person (60 lbs) and we have a total of 93 pounds. So we decided to look for a balikbayan place to ship a box in case that turned out to be the case. Since it looked like we would be here for at least a week, we decided to go shopping at the commissary to have food readily available and not overspending for the food outlets on base. A taxi ride to the commissary is $7, that’s 3 times the amount that we had to pay to go to many places on base in Korea. We ended up making 2 trips to the commissary, on different days, and spending almost $100 there. Between that and paying for the room, we were almost committed to staying until the end of the month, because we were really getting low on money, but still had a little bit of wiggle room. I checked with the passenger terminal twice a day and kept my ears open when some of the other passengers staying at the Navy lodging were talking about flights, just to be sure that we don’t miss anything. They normally have a channel on the TV that advertises the flights, but they were having problems with it while we were there. That figures! So since there is not much to do hanging around the room, I went for walks. Lita was perfectly happy in the room, doing nothing except watching TV, sleeping and rearranging the suitcase contents again and again. I wanted to explore the base and since the taxis are too expensive, I walked. Lita is not a good walker, so I just went alone. I need the exercise anyway. 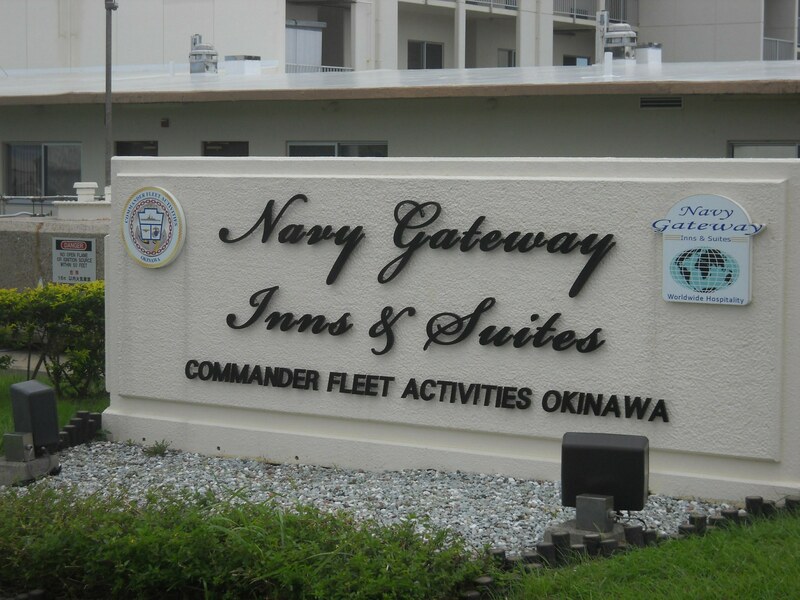 Of course the Navy billeting is not on the main part of the base, like the Air Force billeting is (Shogun Inn), so it takes a good bit of walking to get there, probably 15-20 minutes of good walking. Of course it is hot and humid on Kadena. I walked over to the passenger terminal one day, it’s about a 10 minute walk from the Navy Gateway Inn & Suites, to do one of my daily checks on flights. but there was nothing scheduled. After that I decided to walk to the main part of the base. It was a little closer than I remembered, but still a hot, muggy walk. I did get to see my first live mongoose though. It was running across the road about 20 yards in front of me. The road I was on comes out by the first place that I use to work there. 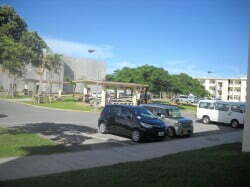 It is a small building, building #155. We used to have many volleyball games and parties in the field behind there, but the field is a lot smaller now because they built another post office there. Actually it seems that they ‘moved’ the post office there. I checked the post office to see if we were able to ship stuff to the Philippines through them, but we can’t. 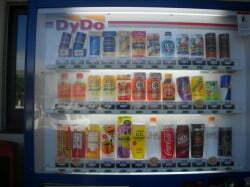 We have to have an APO box on Kadena. I think that if we did have one, we could send stuff to an APO or FPO in the Philippines for free, but I’m not sure about that. There is also a Chilis restaurant across the street from there now. That use to be just a large parking lot where we had our Kadena Karnival’s. It was there one year that I met a fellow from Belton, actually one of my classmates from high school. His name is Stan Burk. He was married to a Korean national and he now spoke Korean. In fact, his wife said that he spoke better Korean than she did. I remember that, because I that it was unusual. Time to walk back to the room. When I got back I stopped by the front desk and just happen to remember to ask about the Balikbayan boxes. Someone there knew where one was just outside of Gate 2. That’s great. We wanted to explore outside Gate 2 anyway, so we can just do it all at the same time. It was always Lita’s favorite shopping area while were stationed there, both times. After what I think was a $12 taxi ride, we were at the USO just inside Gate 2. We could have taken the taxi off-base if we wanted to, but we were unsure of the exact location of the balikbayan store, plus we wanted to check out some of the stores along the way. As it turns out, it was a big disappointment. I’ll have to explain in the next post though. Interesting Knowledge: What you think is so superficial. The brain gets its intelligence from a surface layer of tissue no more than a quarter of an inch thick. Called gray matter, it contains about 8 billion nerve cells interlinked by some 10,000 miles of nerve fibers for each cubic inch. A car-bomb attack on UN headquarters in Iraq kills the agency’s top envoy Sergio Vieira de Mello and 21 other employers. In Belgrade, tens of thousands of Serbians rally to demand the resignation of Federal Republic of Yugoslavia President Slobodan Milo?evi?. Leonard Bernstein conducts his final concert, ending with Ludwig van Beethoven’s Symphony No. 7. Hungerford Massacre: In the United Kingdom, Michael Ryan kills sixteen people with an assault rifle and then commits suicide. Gulf of Sidra Incident: Two Libyan Sukhoi Su-22 fighter jets intercept United States fighters over the Gulf of Sidra and are destroyed by them. Saudia Flight 163, a Lockheed L-1011 TriStar burns after making an emergency landing at King Khalid International Airport in Riyadh, Saudi Arabia, killing 301 people. The cricket test match between England and Australia is called off after the pitch is vandalised by supporters of George Davis. Japanese prime minister Eisaku Sato becomes the first post-World War II sitting prime minister to visit Okinawa. 1961 – The Australian public-affairs show Four Corners starts on the ABC. Cold War: The CIA helps to overthrow the government of Mohammed Mossadegh in Iran and reinstate the Shah Mohammad Reza Pahlavi. Vietnam War: Viet Minh led by Ho Chi Minh take power in Hanoi, Vietnam. Paris rises against German occupation with the help of Allied troops. The 2nd Canadian Infantry Division leads an allied forces amphibious assault on Dieppe, France. The creation of the position Führer approved by the German electorate with 89.9% of the popular vote. The radio comedy show Amos and Andy makes its NBC debut starring Freeman Gosden and Charles Correll. Afghanistan gains independence from the United Kingdom. American frontier murderer and outlaw, John Wesley Hardin, is killed by an off-duty policeman in a saloon in El Paso, Texas. Indian Wars: During an uprising in Minnesota, Lakota warriors decide not to attack heavily-defended Fort Ridgely and instead turn to the settlement of New Ulm, killing white settlers along the way. California Gold Rush: The New York Herald breaks the news to the East Coast of the United States of the gold rush in California (although the rush started in January). Presentation of Jacque Daguerre’s new photographic process to the French Academy of Sciences. War of 1812: American frigate USS Constitution defeats the British frigate HMS Guerrière off the coast of Nova Scotia. Battle of Blue Licks: the last major battle of the American Revolutionary War, almost ten months after the surrender of the British commander Lord Cornwallis following the Battle of Yorktown. Salem Witch Trials: In Salem, Massachusetts five women and a clergyman are executed after being convicted of witchcraft. Queen Mary Stuart returns to Scotland. Oldest known Roman temple to Venus Libitina founded on the Esquiline Hill; institution of Vinalia Rustica begins.